Are you always using a Restaurant com gift card? Right now there is a really great deal on Living Social! 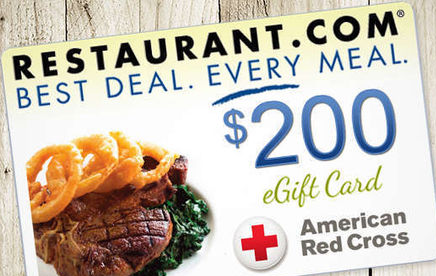 You can get a $200 Restaurant.com for only $40.00! And $4.00 of every card sold is going to be donated to the American Red Cross! It's a savings of 80% for you! You can get this deal through December 21st! Click on the picture below to get your cards! Make sure you read the terms and conditions to see what the limits are if you are looking to gift the card as well!